Location: Abzan territory. The ancient capitol city fortress of the Abzan - it should look solid, impressive but show signs of dragon attacks - scorching, claw marks, etc. Action: Show the legendary Dragon Dromoka attacking the fortress city of the Abzan along with some of her breed. Dromoka could be attacking the ramparts of the fortress with her claws, or crushing some hapless Abzan guards, or breathing a blast of searing white light at the fort or some soldiers - up to you. Dromoka should be noticeably larger (her body is about the size of a school bus) and more badass than her breed dragons. Some Abzan mages are shooting blasts of swirling sand magic at some of the lesser dragons, scouring their wings and tearing their hide. The outcome of this battle is far from predictable. Focus: The battle between clans and dragons. Mood: Epic scale. A brutal war in the desert - steel and magic versus dragons! Location: Jeskai territory. The ancient temple fortress of the Jeskai - it should look mystical and immaculate. 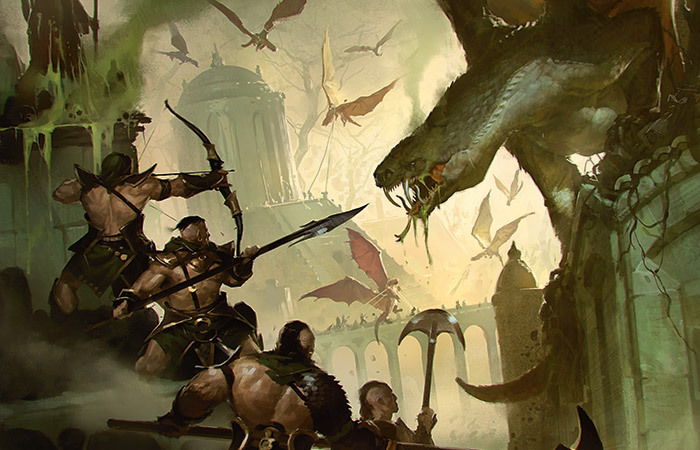 Action: Show the Ojutai attacking the temple fortress of the Jeskai along with some of his breed. Ojutai is attacking the fortress with a blast of frost that instantly freezes some unfortunate Jeskai monks. Be sure that the Ojutai is larger and more awesome than his breed dragons. 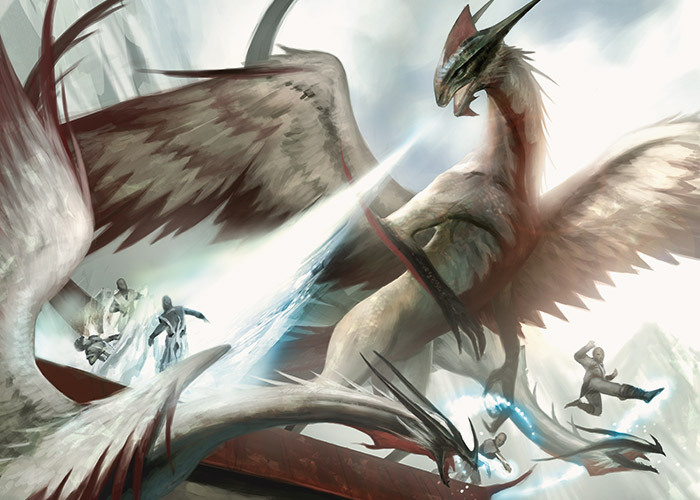 Some Jeskai monks are leaping at Ojutai's breed dragons with glowing snap-kicks of blue magic and blasts of kung-fu punching magic, bashing the lesser dragons. The outcome of this battle is far from predictable. Focus: The battle between clans and dragons. Mood: Epic scale. An all-out kung-fu brawl with magic and dragons! Location: Sultai territory. The sacred jungle temple of the Sultai - it should be made to look elaborate, opulent and sinister - gilded statues, jade, and sinewy vines and trees. Action: Show the Silumgar attacking the sacred temple grounds of the Sultai along with some of his breed. Silumgar is attacking the Temple with a blast of poison breath that acts as a powerful acid, stripping the flesh off of some unfortunate Sultai warriors. Make sure that the Silumgar is larger and more awesome than his breed dragons. The Sultai are retaliating using black magic to wither and rot the lesser dragons of Silumgar's brood, as well as using nets and vines to tangle up the lesser dragons and then swarm them with putrid zombie hordes. The outcome of this battle is far from predictable. Mood: Epic scale. An all-out brawl with dark magic, zombies and dragons! Location: Mardu territory. The main encampment of the Mardu - it should have some kind of interesting natural formations - cliffside dwellings, natural fortifications - that would make the Mardu want to base their camp here. Action: Show the Kolaghan attacking the Mardu base camp along with some of her breed. Kolaghan is attacking the camp with a tangle of destructive lightning that she breathes. The lightning explodes rocks and cooks some unfortunate Mardu warriors. Make sure that Kolaghan larger and more awesome then her breed dragons. 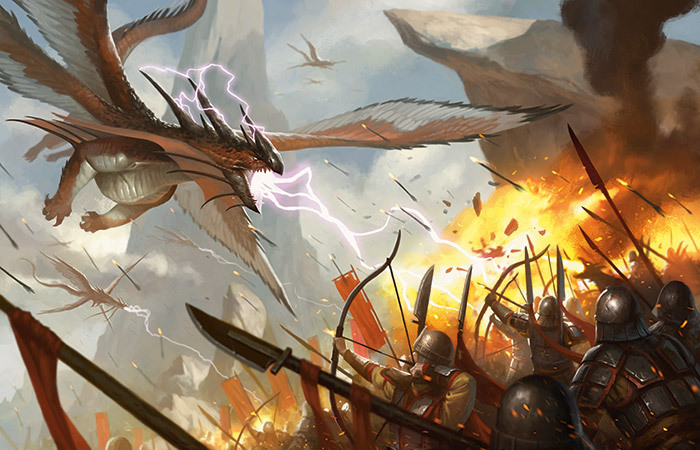 The Mardu warriors use their guerilla tactics to shoot fireblasts and magical fire-arrows at the lesser dragons. Maybe some Mardu rocs have joined the battle - up to you. The outcome of this battle is far from predictable. Mood: Epic scale. An all-out blazing brawl with fire, magic, and dragons! Location: Temur territory. The sacred home ground of the Temur - it should have some kind of interesting natural formations that would make the Temur call it sacred. Action: Show the Atarka attacking the sacred grounds of the Temur along with some of her breed. 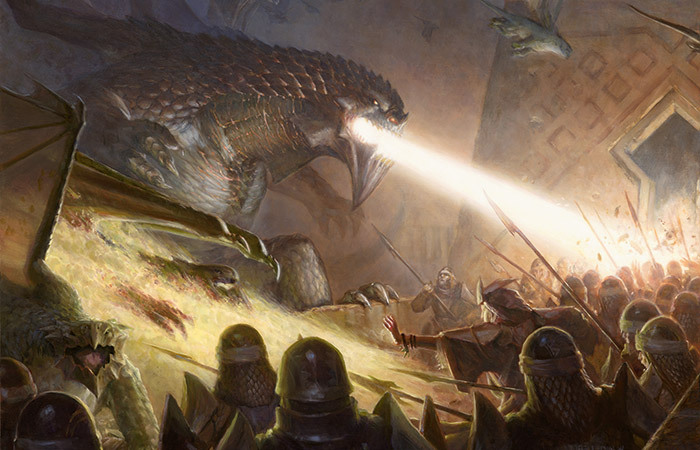 Atarka is attacking the fortress with a blast of dragonfire that flash-fries some unfortunate Temur warriors. Make sure that Atarka is much larger and more awesome than her breed dragons. Wielding swirling green magic, the Temur shamans are summoning massive beasts to do battle with the lesser dragons of Atarka's breed. 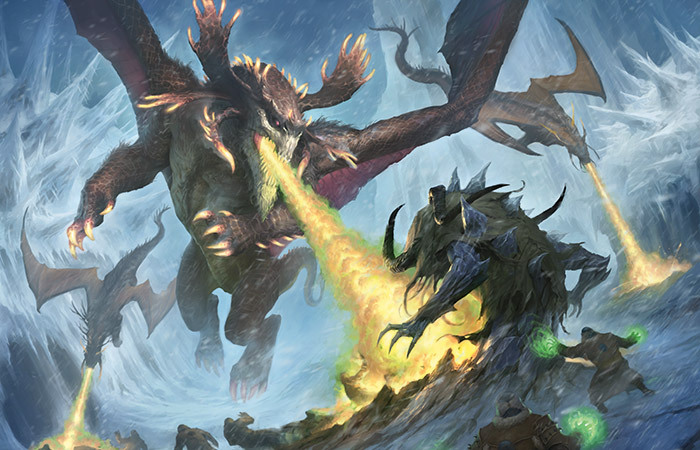 Some Temur mages could be conjuring massive ice elementals to do battle as well - up to you. The outcome of this battle is far from predictable. Mood: Epic scale. An all-out savage brawl with beasts, magic and dragons! If you want to see these sweet Sieges in action this weekend, check out the complete coverage for Pro Tour Fate Reforged.